The interlocking system of the XtenDit™ allows it to be used in conjunction with the Movit® and/or the Minit™ safety barriers providing an economical solution for increased area coverage. 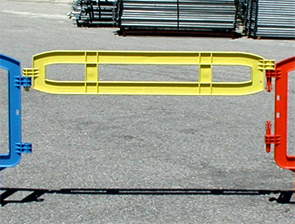 Strategically place an XtenDit™ to function as a swing gate entry/exit. The polyethylene construction makes XtenDit™ durable, rust free and lightweight so it is easy to handle and store.